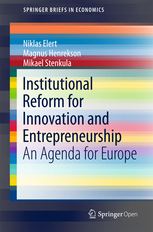 On May 23rd Magnus Henrekson presented “Institutional reform for Innovation and Entrepreneurship: An Agenda for Europe” published in Springer Briefs in Economics last May. You can find the book, published open source here. The book was prepared as deliverable 2.1 in the FIRES project and attracted a large and interested crowd of European policy makers in Sweden. Useful discussions and feedback helped strengthen the FIRES reform strategy that will be finalised in the upcoming months. As such the event was a excellent preparation for the FIRES meeting in Athens, Greece this November and our concluding conference planned for Brussels, May 2018. You can see the book presentation and discussion here. Slides are found here.